With the influx of 10,000 baby boomers into the Medicare system each and every day, the universe is more than big enough for standalone and ENT-housed audiology practices in an APCA future! The focus should be on delivering the best, most efficient services for the patient, and in doing so, success of the practice is assured. Mr. Watson fails to recognize the benefits of the Audiology Patient Choice Act for ENT practices that employ audiologists. If H.R. 2276 and S. 2575 are enacted, ENT practices can make better use of both ENT and audiology provider resources, reduce duplicative services, and enhance productivity. If audiologists are properly recognized and reimbursed by Medicare for all the Medicare-covered services that they are licensed to provide, their associated ENT practices can achieve desired patient outcomes in a more sustainable fashion. Below is a letter, written by Dr. James Lin of Kansas, which perfectly illustrates this point. His strong support of the Audiology Patient Choice Act is grounded in evidence-based practice, which avoids waste, prioritizes quality and access, and seeks to eliminate unnecessary delays in patient care. At the time of this writing, the Audiology Patient Choice Act enjoys the documented support of two physician legislators, including the lead Republican Senate co-sponsor, Dr. Rand Paul, an ophthalmologist. As we all know, audiology professional organizations are oftentimes not adequately representing the views of members when it comes to the Audiology Patient Choice Act. The same holds true for medical societies as well! 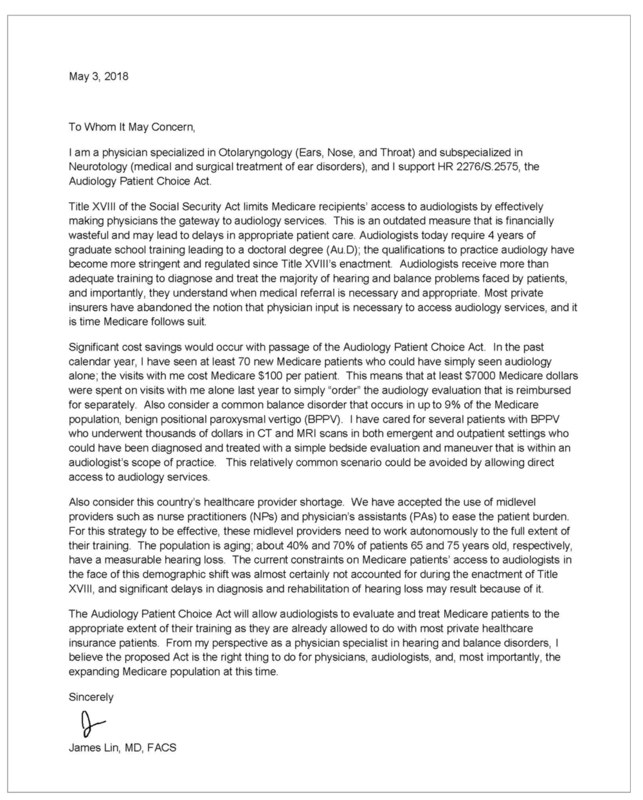 Now is the time to ask your physician friends and colleagues to advocate for their patients by advocating for the Audiology Patient Choice Act! Ask them to write, call, and visit members of Congress so that their voices are heard on this issue! 1 Association of Otolaryngology Administrators. Senate bill would give audiologists big advantage over ENT. The ENT Voice. Volume 3, Issue 4. April 2018. Accessed on May 27, 2018.